Where on the east coast is there a remote anchorage? Remote to me after a few years in Alaska is no chance of reaching a place to tie my boat up to a float in a full day underway. Or no point in waiting for another boat to come into the anchorage. Get on the VHF and have flown in whatever you need or want. Docks are almost unheard of on the west coast. But remote to someone like yourself on the east coast may be very different. How remote is the anchorage you mentioned in the last post? There is no remote in Western Washington state where I live now IMO. 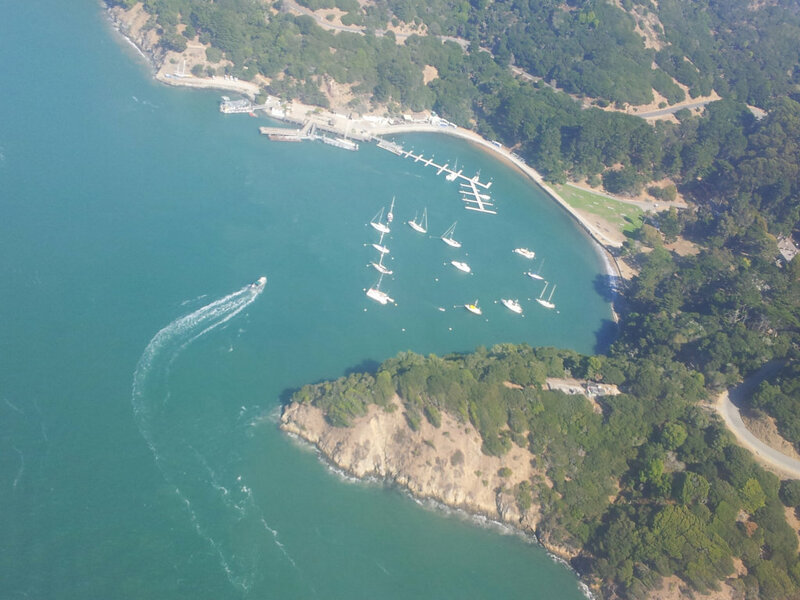 Ayala/Hospital Cove at the Angel Island State Park has a popular moorage (docks for day-use only). Photo taken by FlyWright while my Coot is in the front row and Ray's GB 42 is just to the right. While the SF Bay/estuary is in a heavily populated area, it's not difficult to find an isolated anchorage (but obviously not Richardson Bay, Ayala Cove, and similar popular areas.) 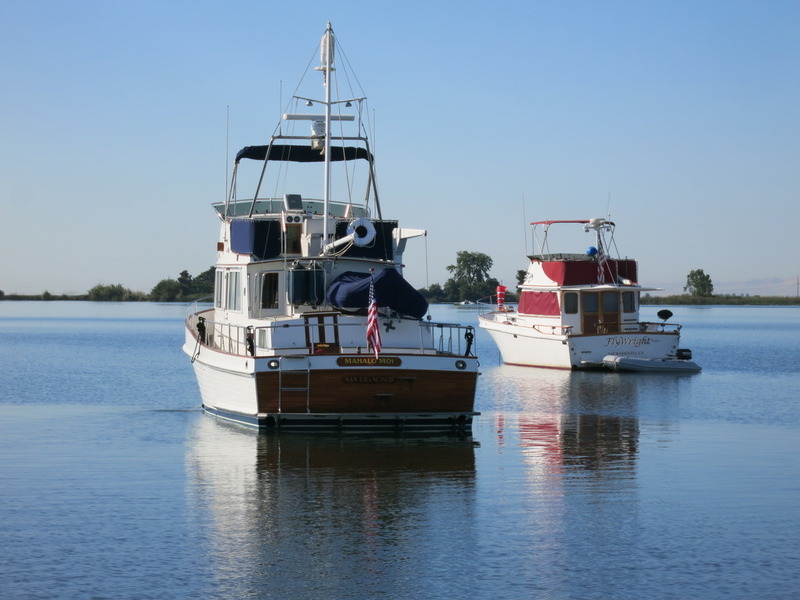 Most isolated areas are in the north bay, northern Suisun Bay, and in parts of the Delta. An isolated anchorage with 13 other boats there? My goodness, I don't have 13 people that live within a mile of me. Every anchorage I stay in is remote. Generally 50 NM or more to the nearest marina. Here in Alaska we rarely will stay in an anchorage where another boat is. There are just so many georgous places to set the hook for the night and so few other boaters that we almost never have to share. Our area is so remote that google earth doesn't even have close up imagery. MB-there are no "remote" anchorages on the East Coast, From Mass south, "remote" means a more than 10 minute walk to the nearest bar! Patterson Inlet on the west coast of Pitt Is is where we rode out the 50knot gale. One day of running would not find us at a float in any direction ... even back the way we came from (Prince Rupert). No choice but to anchor. This is a remote anchorage. Would have been nice to have the inlet to ourselves. The other two boats were probably thinking the same thing. We had to reanchor once because one boat (a Krogen upwind of us w a Bruce) dragged down on us and gave us no option. I used the 18lb modified XYZ anchor. No dragging. First pic is entering the north channel of Paterson Inlet. The 2nd is looking out from Willy at the setup for the anticipated gale. The 3rd is in the morning. The Krogen was almost as close to the rocks as we were before we moved up. The sailboat was on a CQR and moved ahead some in the night too. Don't think he dragged at all. We did two hrs on and off watch all night. Much of the time we were afraid of dragging down and swinging into the sailboat. Didn't happen. Worst night we ever spent on the boat to be sure. That's kinda the way I thought it was. Next time I will be more specific.....you know ....so every one can enjoy the conversation without using semantics to confuse the issue. Yes...yes.....living in Alaska taught me about remote as thought of in some narrow minds....if your experiences are limited to one area of the planet then I guess you only have one set of criteria for remote. I have been anchored in areas as far as Attu in the Aleutians and along the Antarctic Peninsula....not my boat ....but anchored....so yes, I know the extremes of "remote". In the spirit of not being USA-centric...I'm guessing the east coast of Newfoundland and Labrador have some pretty remote anchorages. Is there anybody here from Newfoundland? I've seen pics ... looks more like the Pribilof Is in the Bering Sea. Remote/isolated/alone anchorages have their place, but "buddy-boating" enjoying already-made friendships has its advantages. My definition of a remote anchorage would be one without a marina, without a dock to tie a dinghy to, and with no commercial establishment in sight. By without I mean within two miles by dinghy travel. I have stayed at many of these anchorages on the east coast of the United States as we traveled up and down the ICW. To me, a busy anchorage is one where there are other boats. The rest are remote. It's not often I have to share. Closer to my definition too....even on Kodiak Island, Alaska that would have applied to my boating friends there. Sure it meant all but a handful of bays where there was a villiage...but around the point from any of them was considered remote in the sense company was or almost non-existent. Ayala Cove is about as urban an anchorage/moorage as you can get. Here on the east coast, the Bahamas are rife with places to anchor with no sign of civilization. Many places in Everglades National park (SW Florida) make you feel like you are in your own episode of "wild kingdom". Even in season, we have been tucked into a creek/river in Georgia with no other company than the birds and occasional dolphin, and no development onshore. Here in North Carolina, pretty South River, to name one is a place we liked to go to be anchored out on our own surrounded by nature. As you get further up into Maine, thence Nova Scotia and thence New Foundland (which is the closest eastern equivalent to Alaska/northwest BC, for remoteness and lack of development), more of these "wilderness" anchorages become available. Moraine Cay, Abacos. Great little island with an awesome undisturbed reef. Punchbowl Cove, Rudyerd Bay in Misty Fiords Natl Monument in late March. No VHF coverage. Ketchikan, AK is over 50nm away and didn't see any other boats the whole time we were there. Want to return one day. Some ares of the Maine coast are relatively remote. East of Petit Manan. Well it is all relative. Anchored at Mistake Island, which many consider out there, I could see Jonesport. Even down east there is no place that is even a day from marine services. There are no marinas east of Mount Desert Island. Actually we have remote anchoring close to us. In the Bahamas there are over 700 islands and many are uninhabited. You just find an island with no other boats around and anchor in paradise.